Deutsche Bank: Does it need a bailout? Deutsche Bank has lost half its market value this year and profits have collapsed. No wonder investors are worried. The market panic reached fever pitch this week -- the stock slumped to its lowest level in more than 20 years -- on fears the bank may not be able to afford a massive U.S. fine for trading in toxic mortgages a decade ago. On Friday, shares slumped further as reports swirled that hedge funds had stopped doing business with the bank. German media say the situation is so bad that the government has begun looking at a potential bailout. Those reports were denied by government and bank officials. "The federal government is not preparing any rescue plans," the German finance ministry said in a statement Wednesday. "There is no reason for such speculation. The bank has made this absolutely clear." Deutsche Bank (DB) CEO John Cryan said he had never asked Chancellor Angela Merkel for help, and that government aid is "not an option." The bank also said it is not currently considering asking investors for more cash. But the spate of headlines, and the dramatic share price slide, show just how much is at stake. Deutsche is Germany's biggest lender by far. It has assets valued at 1.8 trillion euros ($2 trillion) on its books. That's equivalent to more than half the size of the German economy. Any suggestion that the top bank in Europe's biggest and most robust economy is in trouble would send shock waves through global markets. The International Monetary Fund rang alarm bells earlier this year. In a report in June, it said Deutsche was the biggest single source of risk in the global banking system. The bank also employs more than 100,000 people, some 46,000 of them in Germany. So how did it get into such hot water? There's a long list of reasons. The $14 billion demand from the U.S. Justice Department related to mortgage-backed securities is just the latest in a string of misconduct charges. Deutsche Bank has already shelled out billions of dollars for manipulating global interest rates and rigging foreign exchange markets. Stricter regulations that have been introduced since the global financial crisis have made its core investment bank safer, but also much less profitable. And it doesn't have a big retail bank or wealth management business to compensate -- smaller rivals control a much bigger share of the banking market in Germany than elsewhere. Banks typically make steady money on the difference between the interest they pay on deposits, and what they charge on loans. When interest rates turn negative -- as they have done in Europe -- that flow of revenue is squeezed hard. Cryan, who took over as CEO just over a year ago, has announced plans to shed at least 35,000 jobs by 2020, dispose of some businesses, and freeze dividend payments. On Wednesday, it sold U.K. insurer Abbey Life for $1.2 billion, a deal that will strengthen the bank's finances. The bank will negotiate hard to reduce the amount it has to pay the U.S. for selling toxic mortgage products. But analysts say a figure above $6 billion may mean it has to raise more money from somewhere. That could be tricky. Is Deutsche Bank about to trigger a rerun of the Lehman Bros crisis of 2008? Bankers and some skeptical investors say not. "This is not as bad as Lehman and the mortgage crisis, or even the Long-Term Capital hedge fund implosion in the late 1990s," said Brad Lamensdorf, a portfolio manager for the Ranger Equity Bear (HDGE) exchange-traded fund. Lamensdorf started to short sell Deutsche Bank a few years ago due to concerns about its balance sheet. And he doubled down on his bet that the stock would fall earlier this summer. Still, he's not predicting a collapse. 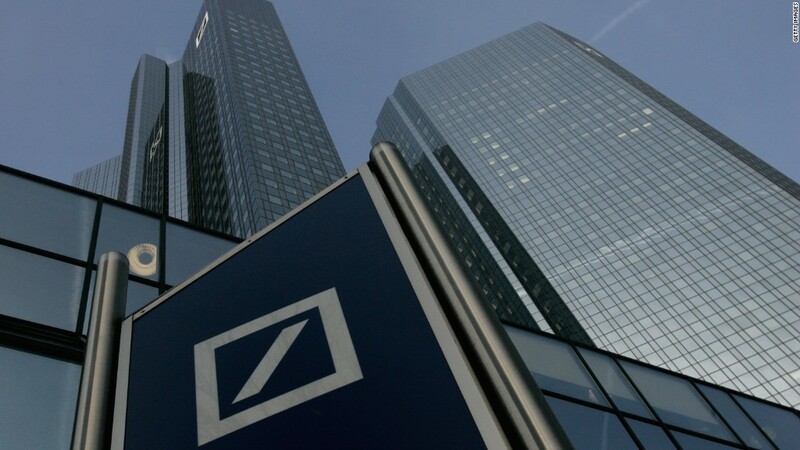 Instead, he feels that Deutsche's rivals will profit as it continues to shrink. "Deutsche is in a weak position because it is so leveraged and doesn't have access to credit. But its problems could mean more business for JPMorgan Chase (JPM), Goldman Sachs (GS) and other big banks," he said.